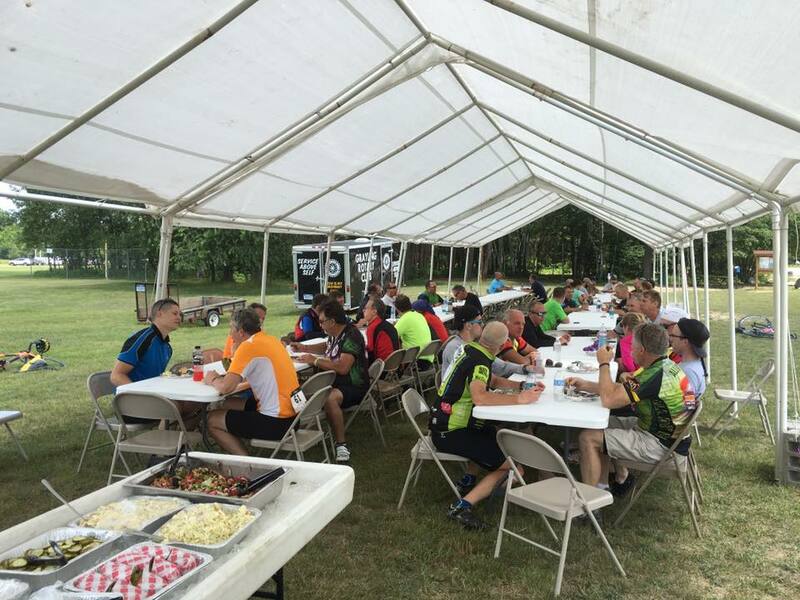 The Grayling Rotary Club's 18th year of producing and managing the Black Bear cycling event. Gran fondo starting format is a mass start for each route with self organized starting corrals based on your MPH/KPH, fastest cyclers in the first corral. 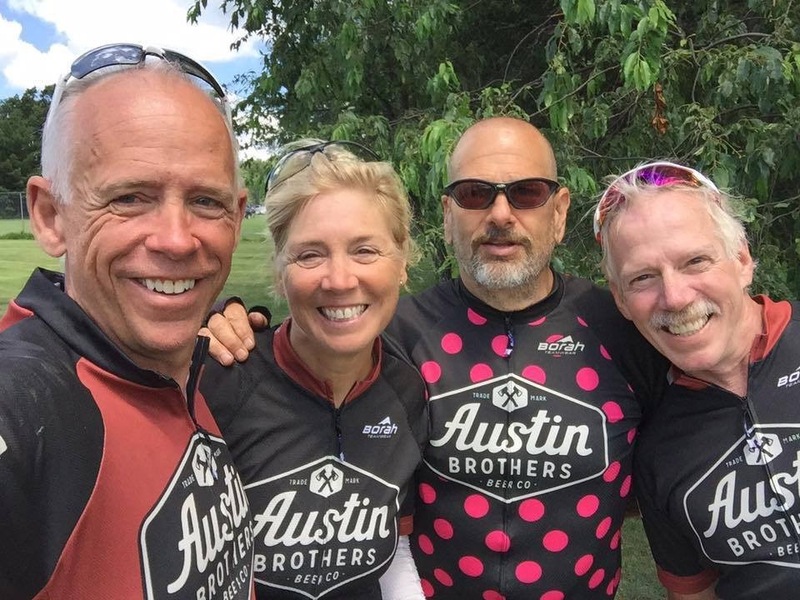 Loyal Black Bear loyalists and those new to the Black Bear can sign up for one of three routes: the Century (100 miles), the Metric Century (62 miles) or the 45 mile ride. Spectacular finish line celebration meal and first craft beer on us! No refunds and it goes to a good cause. The Grayling Rotary is funding a new pavilion at Hanson Hills Recreation Area with proceeds from this event. Is this a race or a tour? Neither, it’s a Gran Fondo. A gran fondo is a mass participation cycling event that got its start in Italy in the early 1900’s. Loosely translated, it means everything from “great foundation”, “great distance” or “great endurance.” Some cyclists ride for the satisfaction and pride of just making it to the finish line. Others want to improve upon their previous times and to challenge themselves, their friends, their teammates. Some ride to win. So, the Black Bear Gran Fondo is a race, a ride, a celebration at the finish line and it’s an event for cyclists of all abilities! Its’ a mass start where riders are required to stage according to their ability. Mass start where riders are required to stage according to their ability to ride in a large group. All riders depart the start line at one time, requiring less experienced riders to position themselves toward the back of the mass start group. All route timing is relative to when the riders cross the line, so no time penalty will be incurred by starting further back in the group. ThIs doesn’t mean all riders need to ride in a large group; the fastest riders start at the front and they will, most likely, end up riding in a large, fast group. All other riders can progress at the speed in which they are most comfortable; some will ride alone, some will ride with others progressing at a similar speed. In a road bicycle race, the peloton (from French, originally meaning 'platoon') is the main group or pack of riders. Riders in a group save energy by riding close (drafting or slipstreaming) near (particularly behind) other riders. When is the Black Bear Gran Fondo scheduled for 2018? 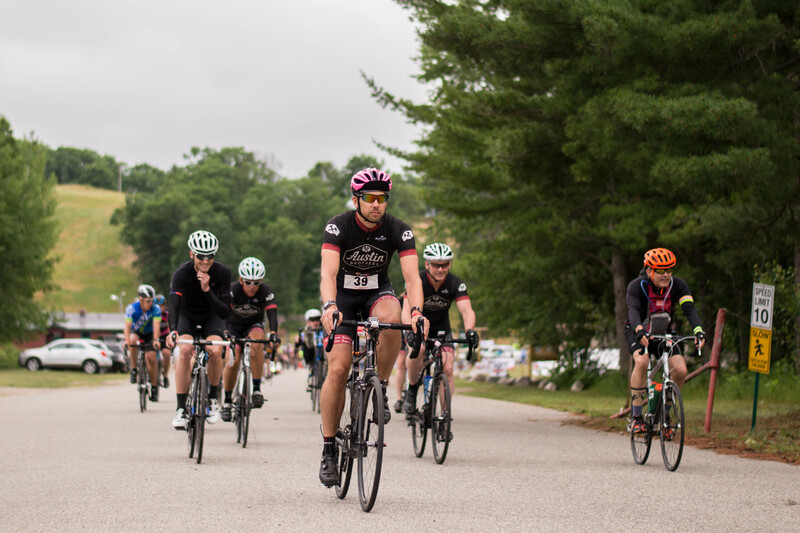 Where does the Black Bear Gran Fondo start and finish? The start and finish lines are at Hanson Hills Recreation Area (HHRA) 7601 Old Lake Road, Grayling, MI 49738. When does the Black Bear Gran Fondo start? How are the riders started? 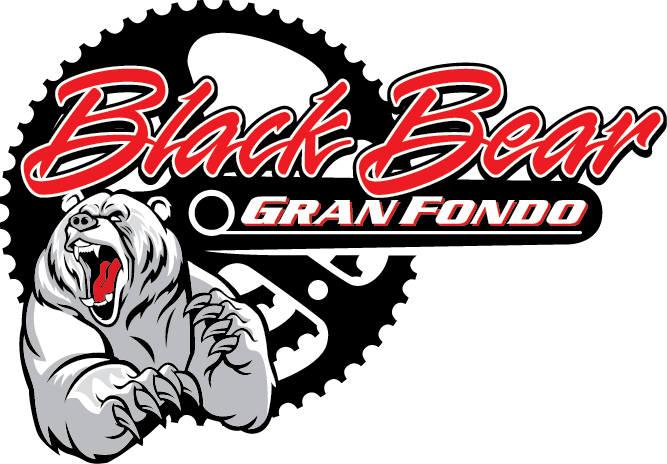 The Black Bear will be a gran fondo start, that is, a mass start where riders are required to stage according to their ability to ride in a large group. All riders depart the starting line at one time, requiring less experienced riders to position themselves toward the back of the mass start group. If any rider is in doubt of their ability to securely hold an even line at high speed with riders in close proximity, it is vital that you line up toward the back of the starting line group in the appropriate corral. All route timing is relative to when the riders cross the line, so no time penalty will be incurred by starting further back in the group. The Active.com site will turn off on Sunday, July 8 at 11:59PM. Nope. 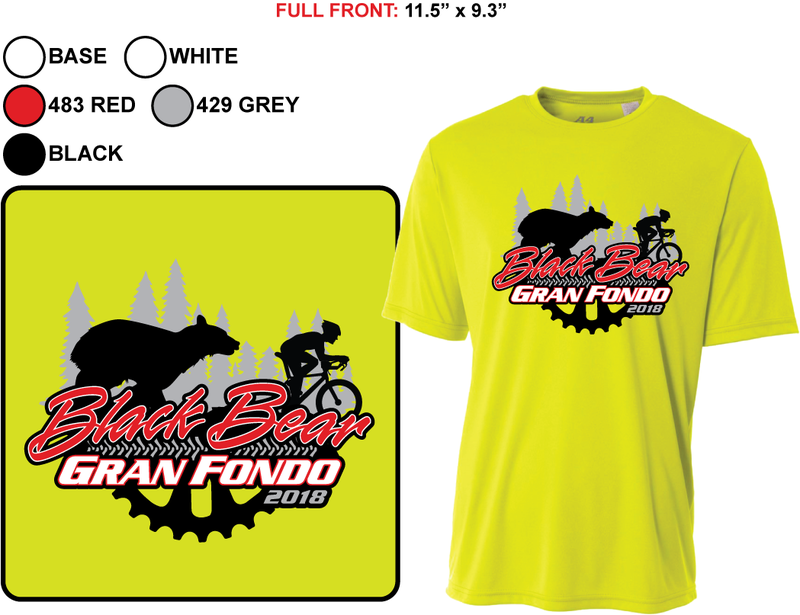 Our goal is to grow the Black Bear Gran Fondo as our event is a well kept secret in many cycling circles and we are going to try a few things this year to incent people to sign up in pre-registration. 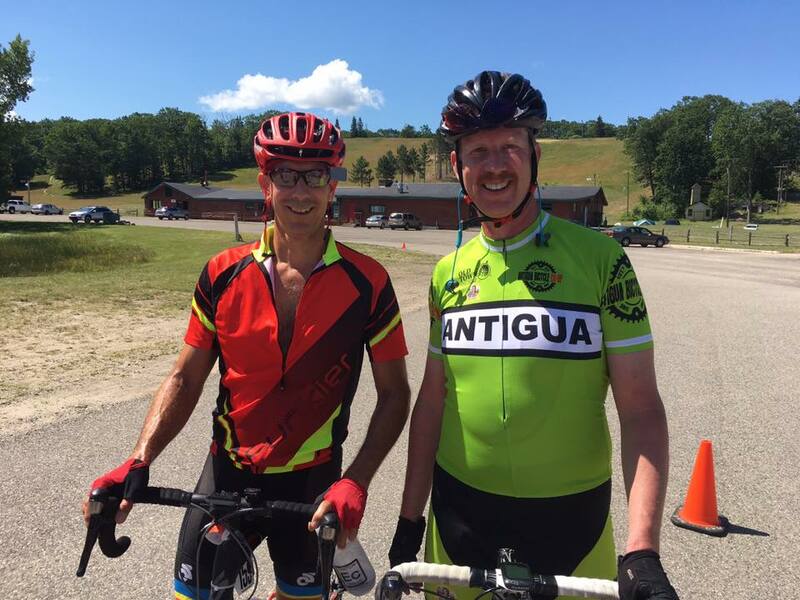 In the meantime, we ask our cyclist participants and friends to spread the word about the Black Bear Gran Fondo, share our Facebook posts with your friends and bring a friend on July 14 to another G-R-R-R-R-E-A-T ride! Yes, all routes can register on-site at Northbound Outfitters on Friday, July 13 between 5:00PM and 7:30PM and all routes register at the Main Lodge of Hanson Hills Recreation Area on Saturday, July 14 between 6:30AM and 8:30AM (please note, the 100 mile route starts at 8:00 AM, the 62 mile route starts at 8:30 AM, the 45 mile route starts at 9:00). Black Bear registration fees are $60 during on-site registration of event weekend. How can we say this so there is no confusion: Absolutely, positively, without any doubt: YES!!! Helmets are definitely required for all three loops for rider safety. If you don’t have a helmet, you will not be allowed to start your ride. How good are the riding surfaces? All roads are paved and, overall, most are very good; there will be very few areas that require you to mind your wheels and there will be variation in the shoulder width, some nice and wide and others that are skinnier. We’ve done our very best to provide you with the best roads possible in combination with features that make the routes interesting and fun. We have some awe-inspiring elevations to challenge all riders too! Road, tandem and recumbent bicycles are best suited for these routes. .
Will there will be some type of breakfast food available on Saturday morning? What is offered at the rest stations? There are food and water stations with both hydration and nutrition: PBJs, sweet and salty nut mix, watermelon, orange smiles, bananas, water and sports drinks.The last rest station for all loops is a delicious celebration meal at the finish line at Hanson Hills Recreation Area (HHRA), so save room! What goes on at the finish line? A party! Music, a tasty celebration meal, (yes, this is really delicious food), craft beer and friends to celebrate your accomplishments! Hanson Hills Recreation Area is a beautiful park-like setting right and a hidden gem in Grayling, Michigan with lots to offer including a playground for the little ones, mountain bike/hiking trails, disc golf and we will get some corn hole games going! How important is rider safety? Safety is our highest priority and we ask all cyclers to abide by the known Rules of the Road for bicyclists. If you are not familiar with them, the League of Michigan Bicyclists has great information that will help you out. Ride in single file and as far to the right as possible at all times. Do not cross the yellow or center line. Any additional tips for a safe ride? If you are not accustomed to riding in a pace line (several cyclists following closely behind one another) do not attempt to do it during your first organized tour. If you want to learn the skill, seek the help of a local bicycling club or learn the skill with a small group of friends. It is rude to "sit on" someone's wheel and draft if you don't know the person and haven't asked permission to be there. Not only is it rude, it could be dangerous or disgusting. The lead rider doesn't know you're there and will not point out road hazards. They may avoid a pot hole and you may end up hitting it. Along the disgusting line, if that lead rider doesn't know you're back there drafting, they may decide to clear their throat or nose into the wind. The wind deposits the goo on you. Look ahead a good distance so you can anticipate trouble. You can detect a good number of problems if you keep watch about 20 to 25 yards (60 to 75 feet, or the length of a swimming pool) ahead of yourself. Although you are looking about 25 yards ahead, be aware of items in your peripheral vision: a car crossing the centerline a quarter of a mile away, a dog running toward you from a farm house 50 yards away, a truck that looks like it may not stop at the intersection ahead of you, etc. If you are in a working pace line, point out hazards in the road to riders behind you. There several different ways to signal something is on the road, beside the road, moving on the road (a human or animal), etc. You can work out a signal system with your group or at minimum, simply point to the hazard. When riding in a pace line, do not cross wheels with the person ahead of you. This means do not let your front tire cross a line that is perpendicular to the back tire of the person ahead of you. If they make a sudden move and swerve to the side, you go down. Whether riding alone or in a pace line, ride a steady, straight line. Weaving all over the road wastes your energy and is dangerous to others. Be steady and predictable. Riders that make sudden, darty moves are dangerous. (To avoid darty, see tip #3 again. )When heading into aid stations, be aware of people in front, on the side and in back of you. Ignore the length of the port-a-potty line until you are safely off the bike. Exiting the aid station, be alert for other riders coming in and trying to get out. Last, but not least, do not ride five abreast on an open road, blocking motorists. I know you paid good money to participate in the event, but this does not give you the right to hold traffic up for five miles. (The Black Bear Team was scolded by the local State Police in 2017, so please don’t get us in trouble J) Be courteous to motorists and more than likely they will reciprocate. SAG is short for Support and Gear. Our roving SAG vehicles are clearly marked and contain our very important and dedicated SAG mechanics who can make some quick repairs and get you back on the road. SAG mechanic cell phone numbers will be provided to all registered riders. “SWEEP” cars follow the last rider from each of the three routes making sure no one is left behind. All sweep vehicles will be labelled as such with vehicle paint and will be driven by volunteers equipped with basic bike maintenance and first aid kits. Sweep drivers will be able to provide or coordinate a ride for any riders that wish to drop out of the race. Any riders that choose to remain on the course after the sweep vehicle moves past them will be riding unsupported at their own risk. Sweep support will end when the last riders have been brought in, or when timing stops at 4:00 PM, whichever occurs first. Are there directional signs along the route? Yes, there are directional signs, and, we attempt to have corner marshals with flags at each corner where a turn is made. Some corners may have arrow signs only, and those turns are the obvious ones. We will have very few shirts with limited sizes available for purchase during packet pickup/on-site registration and those will be available on a first come, first served basis. 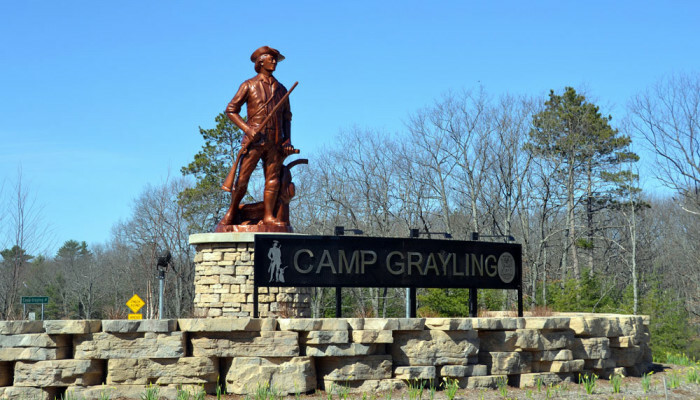 This is a Grayling Rotary event and all proceeds from the event are dedicated to supporting resource gaps in the community. If you are unable to make it, your registration fee goes to some very good causes in our community. It is possible for you to transfer your entry to another rider for a $5 fee on Active.com or by contacting riemers55@gmail.com. Can I switch routes after I have registered? Yes, please let the registrar know via email or during packet pick-up/on-site registration times during event weekend. If you end up changing your mind while experiencing the route, please let the timers know that you have switched routes. Parking areas will be designated for the Black Bear at Hanson Hills Recreation Area and there is plenty of parking space available. There is no designated area to park your bicycle, many lay them on the grassy area behind the celebration tent until ready to leave for the day. We encourage you to load your bikes on your car carrier once you have completed the Black Bear. Bathroom facilities are available at the Main Lodge of HHRA (Hanson Hills Recreation Area) and, additional porta-potties will be available near the ball field of HHRA. In addition, we will have porta potties at all of our rest stations along all routes. Is camping available on the HHRA (Hanson Hills Recreation Area) grounds? Yes, free rustic camping will be available on the Hanson Hills Recreation Area (HHRA) grounds behind the Main Lodge on Friday night, July 13, 2018; we only ask that you break camp no later than 5PM on Saturday after your ride. Just a note, rustic camping means: no water and no electricity; porta-potties will be available for Friday night campers. Main Lodge bathrooms will be available through Friday afternoon and early Saturday morning until the end of the day. For those who want to make a weekend of it, we suggest you make reservations at one of the nearby state parks (Hartwick Pines, North Higgins Lake, South Higgins Lake) or any of the private campgrounds in the area. Rest stations, SAG mechanics, timers and rest stop volunteers all have cut-off times on for their availability to our riders and we will adhere to these limits so please make a plan if you are still on the course after these times and you require any type of support. If you finish your loop after 4:00 PM, and you would like your time included in the official results, you may self-report to hello@enduranceevolution.com, or click the "contact" link that will appear on the results page of our chip timers, Endurance Evolution. You sure can! They can cheer you on to victory at various locations along the route and at the finish line. They can also join you for the finish line celebration meal with their paid meal purchased in pre-registration only. Are there things for my family to do? We’ll have corn hole games going on at the finish line. 11 miles of family-friendly recreational bicycle pathway from the intersection of W North Down River Road and the I-75 Business Loop (Old US27) all the way to Hartwick Pines State Park. Can I purchase additional meals for family/friends? Yes, only in pre-registration up to a postmark of July 6 on the printed PDF form and up through Monday, July 8 at 11:59 PM on Active.com so we have a count to estimate food amounts. The meal is part of the registration fee for riders and you can plan for meals for family/friends with paid celebration meals purchased in pre-registration. Food will be served from 11:00 AM until the cutoff at 4:00, however, we’ll have box meals available for those who finish after the buffet line closes. The show must go on, it’s a “rain or shine” event. Can I volunteer my time to help in the Black Bear Gran Fondo?